The Right Honourable Sir Winston Leonard Spencer Churchill commonly regarded to as Winston Churchill was born in Blenheim Palace, Oxfordshire, England on 30 November 1874 and died on 24 January 1965. 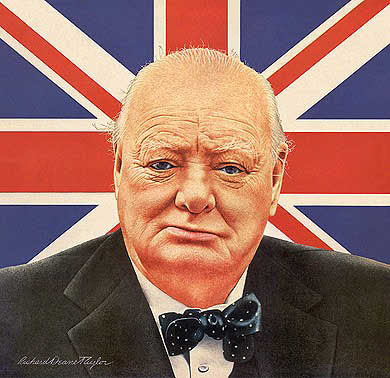 Winston Churchill was a leader, statesman, author, and orator; he was also a British politician and prime minister of the United Kingdom (1940-1945, 1951-1955) who helped lead his country and the Allies to victory as the prime minister of Britain during World War II. His courage, decisiveness, political experience, and enormous vitality enabled him to lead his country through the war, one of the most desperate struggles in British history. It was the nation and the race dwelling all round the globe that had the lion's heart. I had the luck to be called upon to give the roar. A man does what he must - in spite of personal consequences, in spite of obstacles and dangers and pressures - and that is the basis of all human morality. Kites rise highest against the wind - not with it.